I'm doing this one out of chronological order because it's a crazy oddity, and I'm not sure of the date on it. This is another one of those weird Japanese bootlegs my dad picked up in Hong Kong during the Vietnam War. 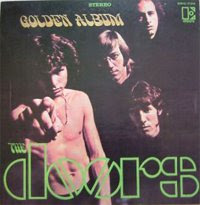 The cover says "Golden Album" on it, but the LP itself says "Golden Doors." I've been trying to find original copies of this online, and all I can come up with are versions like this one, where it's a 5-song, 33rpm 7". The one I have is a full album on a 12", and it's comprised solely of songs from the first three Doors LPs (hence the 1968 date I'm estimating). So, not much to say about the music, though I guess it could have been a slightly more listener-friendly best-of. "The End" closes side one, "When the Music's Over" closes side two, and there's five songs on each side other than those. They're not in any sort of discernible order, but there's no glaring omissions, with the possible exception of "Moonlight Drive," which could have replaced "Back Door Man" as a more "radio" type song. Other than that, all the hits are here. And, from the lyrics to "The Crystal Ship" on the back, where the original line is "I'll drop a line": "I'll trap a ride."